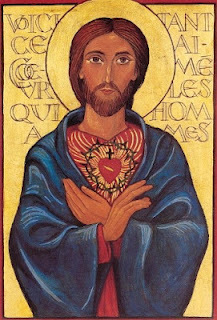 This year the Feast of the Sacred Heart of Jesus falls on the 15th of June. It’s always a Friday, eight days after the feast of Corpus Christi (which is a Thursday but frequently transferred to the following Sunday). Unfortunately our usual choir members are busy, so the plan here is fairly simple. Mass 11 (orbis factor) and Credo 1. The introit is like the one for Laudate Sunday (4th Sunday in Lent) so the tune might be familiar. I’ve put in the extra verses just in case. The Communion antiphon reminded me of Ave verum so that’s in there too. See a video here. Anyway, I said I’d put CDs and booklets together so there’s a bit more recording or scrounging to go to make the full set. Also this is the day for the act of Reparation to the Sacred Heart of Jesus, which can be found in the hymnbooks. Also we usually finish off with an English hymn - which Sacred Heart hymn do you think? To Jesus Heart all burning / While ages course along Divine Love in a human Heart / Jesus in Your Heart we find Sweet Heart of Jesus or good old Hail Redeemer King Divine! If I figure out how to add a poll to this post I will, but until then use the comments box.